This summer I have been a salad making machine. Not only salads with leafy greens, but this type of salad too. Here we have an herbal (parsley, basil and mint) pea salad tossed in a tangy Greek yogurt dressing. You could use fresh peas if you steamed or boiled them first. I used thawed baby peas and they were perfectly tender and sweet. This recipe comes from Ethan Stowell. A respectable chef who owns NINE restaurants in the Seattle area, one of which is cleverly named “How to Cook a Wolf”. According to their website, “How to Cook a Wolf pays homage to MFK Fisher and the philosophy of taking simple ingredients and transforming them into culinary splendor. The food is uncomplicated and rustic. It’s an ever-changing menu of Italian inspired small plates”. My kind of cooking, and my kind of place. In a large bowl, whisk the yogurt with the lemon juice and olive oil. Add the parsley, basil and mint; season with salt and pepper. Stir in the peas and cucumbers and serve. Hi Sally. I haven’t used yogurt in salad dressing very often and this salad sort of “got the ball rolling”. It was so fresh and tangy. Delicious. What a great way to fix peas. Will definitely save this recipe to try when I get some peas. Great salad Jovina. I didn’t realize how much I enjoy peas in salad form. Really nice with the yogurt dressing. What a lovely dish, I am loving the simple list of ingredients and I know it will taste incredible. I do love peas and never thought to put yogurt with them but it really is brilliant. Thank you! Almost too simple to even count as a recipe. :) The cucumbers were a nice refreshing crunch with the soft sweet peas. Deliciously tangy too. Gorgeous! It looks like it would be sooooo satisfying! Oh my! Must try. How is it that sweet peas always look so beautiful and enticing? I agree with you. Sweet peas are very photogenic aren’t they! Another cracking salad, my friend. Would’ve never thunk it myself but I’ll give it a bash!! Thanks. Simple ingredients, creatively put together. Perhaps some mint or fresh oregano might go as well. Ooh yeah sounds good! Loving Greek yoghurt salads at the moment too! Wouldn’t have thought of this one- like it! Yes! I couldn’t have thought of this salad either. Ethan Stowell is such a fabulous chef, I knew without a doubt this would be good. And I love the simplicity of it too. Thanks! I’m saving this recipe! Baby peas are a dinner staple in our house, but I’ve yet to convince the husband that he likes peas (as much as he likes pizza), this salad might do the trick…. Hahaha peas pizza! Worth a try! This is beautiful. I have spent my summer making salads (not like this beautiful one..WOW) and reading MFK Fisher, including her “How to Cook a Wolf”. Something about her makes me sad. But she really loved food and reading her was like watching a flower open. I’ve moved on to David Leibovitz who has me laughing out loud. This dish is so pretty. I love that you use yogurt and not sour cream and all of those fresh herbs with lemon juice. You’ve made salads exciting again. Beautiful presentation. Yes sweet life in Paris. Great recipes too. It is soo funny! Read it. He was influenced by Alice waters who also influenced mfk. And you are in the center of all of it. Read sweet life! You will laugh and drool. What a beautiful salad, love the crispy celery against the soft peas and the herbs that you used. I know I would love that restaurant. This looks just heavenly, just the perfect combination of light and filling. Good idea cutting the mayo out of the diet! Wish I could do the same Sandra. I love the stuff too much. Even as a small child I remember loving mayonnaise. I’ve tried too. Although there are many recipes that typically call for mayo that I would rather use yogurt. But, love mayo on sandwiches…ahem, and artichokes! I agree with you about full fat greek yogurt. I never buy the lighter versions! Full fat just taste so much better doesn’t it! Thank you. :) Still thinking about your wonderful rhubarb and cinnamon cake. Love that it is raw! Light yogurt just tastes horrible to me now that I’ve tried real full-fat! Ah thanks :) I just ate the last slice and am already planning on making another one! 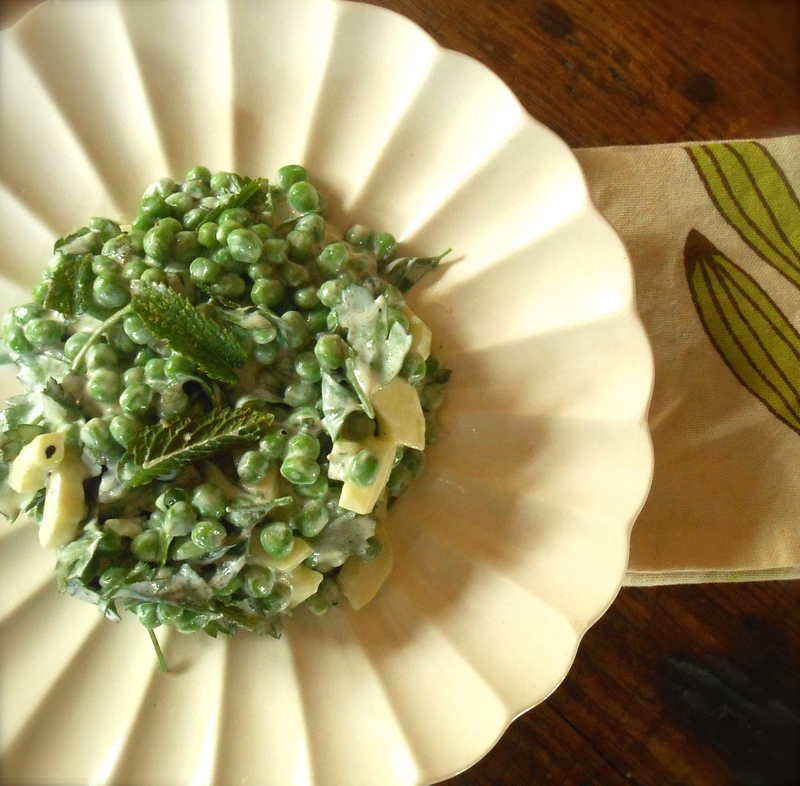 Love your beautifully plated pea salad with all its herbal goodness. Thank you Karen. I think the herbs were what really made the salad. It was wonderful. Especially the mint. Can’t get enough mint these days! I am beginning to think our cabinets are stocked very similarly. :) I have to chuckle at your “onto the chalkboard with it”! I am imagining magical things occur after they appear on your chalkboard! Wow, what an original little salad Seana! This is something I’m going to HAVE to try come summertime. So pretty too on your beautiful scalloped plate. I love that you are open-minded enough to use frozen peas – I’ll tell you, the frozen ones often taste better to me than the fresh ones I grow. I hate admitting that, but it’s true. This is a lovely salad, and in a season of potlucks and barbecues where make-ahead dishes that can be served at room temp are a necessity, this one is perfection. Oh my gosh Valerie, I couldn’t agree with you more. I do like fresh peas but more so in soups. Frozen are so much more tender and sweet and you are also right about bringing a salad such as this to a potluck. It serves so well at room temp. Thank you! I would love to dig my fork eh…spoon into it. Spoon gives bigger bite ;). Lovely salad Seana! Lovely salad, and a great use of all ingredients! I do love a tangy/herby dressing too. what a pretty picture that makes :-) I’m not overly fond of peas, but this looks good to me! Hi Seana– Who could resist eating at a place named “How to Cook a Wolf”??? The peas look so tender and inviting! great recipe! I’ve seen review of he Walrus and the Carpenter on tv and in food magazines– Just another reason I’d love to ravel up to Seattle and eat myself silly! have & love all the ingredients, totally live on salads in the summer, love the recipe = MUST make this. Thank you for sharing! Loving your intro, salad making machine! Besides that, even though I really like peas I’ve never had them in a salad before. Not that I can think off. And I’m really enjoying the idea of that dressing. Maybe I’ll try and buy in some frozen peas and use the rest in a thin soup. This looks absolutely beautiful. And I would never have thought to put peas in a salad! Also, love the plate! Hi Gab. Thank you so much for your kind comment. :) Peas are really good in a salad, you definitely should give it a try, if you like peas you’ll love a pea salad. I love fresh peas from the garden. Following your blog now. Hope you enjoy mine. Emma. 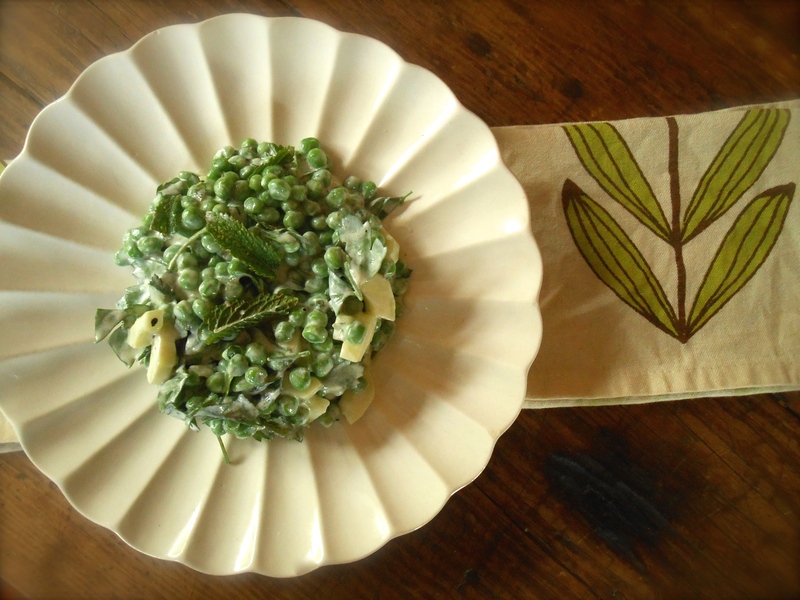 You are currently reading herbal baby pea salad at COTTAGE GROVE HOUSE.